Aquafine’s SP & SL Series provide a compact design and economical ultraviolet water treatment for low-flow disinfection applications, such as laboratory and medical facility water, pharmaceutical make-up processes, final electronic component rinsing and recirculation loops, to name a few. The SP series models produce little change in water temperature, even after prolonged periods of no water flow, making them ideal for such applications as water for vending machines. 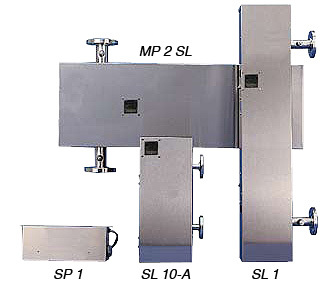 The SL 1 and MP 2 SL models may also be configured for TOC reduction or ozone destruction applications found in high purity or ultrapure water processes.Available in 5 standard models, the SP and SL Series feature flow rates ranging from 1 to 24 U.S. GPM (0.2 to 5.5 m3/hr). The Aquafine SP & SL Series consists of a 316L stainless steel treatment chamber and a 304 stainless steel control panel in one integral unit. Excluding the SP models, all units come complete with a standard Running Time Meter. All models are compact in size, maximizing installation flexibility and preserving floorspace. Single-ended lamps allow quick change-outs without tools. *** Dose Level: 22 mJ/cm2 after 4,400 hours of operation. **** Dose Level: 30 mJ/cm2 after 8,000 hours of operation. Capacities listed are for Disinfection only.